Jeremy: Zelda was clearly a big inspiration for the design of Oceanhorn. What were some of the other inspirations that went into Oceanhorn’s development? Heikki: Oceanhorn is a product of our love towards the classic Action RPGs and one of the biggest inspirations was also the first Seiken Densetsu game for Gameboy. An amazing remake of that game was just released under the name Adventures of Mana. Japanese composer Kenji Ito, who did the music for Seiken Densetsu, also provided four amazing tracks for Oceanhorn! You can listen to Oceanhorn’s complete soundtrack for free on Youtube. Jeremy: I found that Oceanhorn’s world seems to have a very in-depth backstory and I really got a sense of history on each island. Is there more to the game’s backstory that doesn’t feature in the game? Heikki: I really wanted to create a game with deep history and evoke the sense of wonder as you explore the ancient locations and try to find out what happened to the realm of Arcadia. To achieve this, we wrote the detailed backstory for the world. It was easy to come up with meaningful locations after we had nailed down the events that lead to the destruction of the world. Oceanhorn: Monster of Uncharted Seas concentrated on telling the story where mankind was taking the first step into the restoration of the world, thanks to the actions of a boy seeking for his lost father. The boy lifts the curses on Sacred Emblems that maintain the world, and deals with an ancient sea monster Oceanhorn, that has terrorized the world for the past thousand years. Is there more to the game’s backstory? You bet. That is the story we want to tell! Exploring ancient ruins in Oceanhorn. Jeremy: Which island in the game is your personal favorite? Heikki: I have three favorites in the game and they are all big islands with a lot of gameplay. Tikarel is a special island, because it is a central hub in the game’s world where you will often visit. For this reason, it became an island layered with a lot of story and gameplay elements that you will discover at different times in the game. The island feels alive. Sky Island has the best introduction and flow overall. Kalle Ylitalo’s musical theme for Sky Island is phenomenal and it really sets the tone for this part of the game. Player feels powerful: he has already claimed two Sacred Emblems and he is determined to get the last one. We have many surprises up in our sleeve for this part of the game! It all begins with a hot air balloon ride. When player reaches the island, he sees looking glasses that point downwards and might wonder if someone lives on Sky Island. He finds monsters he has never seen before, mechanical structures and robots. When he finds his way to the town, player learns a lot of the personal background story of the main character’s parents and realizes that he has had the Emblem of Sun with him all along in a form of his Mother’s Necklace! From a level design perspective, Island of Whispers is one of my favorites. Like Tikarel, Island of Whispers is packed with puzzles and secret treasures. This island was added to the game after the initial release, and it was designed for the end of the game, so we wanted to provide players more of the same elements that they loved about Oceanhorn. At this point, we knew our own game inside and out and knew exactly what to do with the elements we have in the game. In many ways Island of Whispers is an entity of its own: it has its own background story that tells about the childhood of one of the key Oceanhorn characters. The island itself was designed to work like a mini-overworld, with areas and secrets unlocking as you explore more. In addition, the island breathes what Oceanhorn is about, or what we want it to be: ancient technology, deep story, amazing music and rich gameplay. The island of Tikarel serves as a central hub in the game. Jeremy: Is there anything that you had wanted to include in Oceanhorn that didn’t make the cut? Heikki: Oceanhorn was supposed to be an unlinear game, where you could collect the emblems and items in whatever order you wished and attempt to defeat Oceanhorn mecha even right at the beginning of the game. The background story was supposed to be learned from the stone tablets and ancient books. For a long time, we were developing the game towards that direction and we already had many of the islands ready. Tikarel, Great Forest, Old Fortress, and Graveyard Island are some of the oldest islands in the game. Even though they have changed a lot during the development, they date back to this different kind of game we were making. When we played the game ourselves and let some of our friends play it, we found out that players lost interest soon and were not very keen to read the stuff from the graves and stone tablets, so it was hard for them to get the picture of what the story is all about. That was when we decided to restructure the game into a much more traditional experience. That was the best decision we made! All of a sudden, things started to fall in places (also from the development perspective) and we got excited ourselves to get to experience the game’s story this way. We wanted to tell the story, so we had to be in the helm to tell that story. Jeremy: Oceanhorn is easily one of the most ambitious game I’ve seen on iOS. Were there a lot of challenges involved in developing for that platform? Heikki: I have been a portable gaming fan ever since I got a Gameboy when I was 8 years old, so when I got my hands on the first iPhone and iPad I was trembling from excitement to do a game for that platform. Our first game Death Rally was a great success and we really learned the iOS platform inside out with that game, so it was fun and easy to start developing Oceanhorn. One of the best elements we had in the development of Oceanhorn was the level editor on iPad! It was fun and easy to create the levels, that you could immediately test on the device. I think none of the levels of Oceanhorn were done at the office: most of them I did on my home couch, during airplane flights, at our summer cottage, or on a skiing trip. You name it! I had my iPad with me all the time, to do some levels! From the technical perspective, developing games for the iOS platform is a smooth process. Of course, when you’re developing for mobile devices, there is always some fiddling needed to get past the problems caused by power save modes, memory limitations and such. However, it must be said that Apple hardware and iOS in general provide a very pleasant environment to work with. Jeremy: Oceanhorn is one of only a few games that has successfully made the transition from iOS to PC. Were there any special considerations in porting Oceanhorn? Heikki: We knew from the fact that it is always an uphill battle for a mobile game to earn respect on PC and other big platforms. We had done this painstaking porting job once before, when porting Death Rally from iOS to PC, and we did it as well as we could. Death Rally failed on PC even though we had done our best and redone the controls, renderer, updated every asset in the game, added ton of extra content and gameplay features. One of the biggest reasons for this was the price point. The game cost 99 cents on Appstore, but 10 dollars on Steam. When we started to make a PC port of Oceanhorn, we were confident right from the beginning that it will not meet the same fate as Death Rally. We had a great critically-acclaimed game, we knew that we can make a perfect, upscaled port of the game and most importantly, Oceanhorn was much more suitable game for the big platforms and it’s price point was in line with the PC release. Jukka: Obviously, we wanted to provide the best possible PC experience for the existing and new fans of the game. To achieve that we had to tweak or even reimplement most of the game’s graphics assets. We added four times more polygons, sharper textures, normal maps, detail objects, and lots of new lighting effects such as dynamic ambient occlusion, soft shadows, and real-time reflections. We also put in a lot of work to make sure that the game plays great with physical controls whether it is with mouse + keyboard or with a gamepad. Jeremy: Oceanhorn recently featured in a Humble Bundle. How did you come to the decision to include your game in a bundle and how did it work out for you? Jukka: Over the past year or so we had many offers to publish Oceanhorn in bundles, but had always been quite cautious about it. However, when we had the opportunity to include Oceanhorn in Humble Jumbo Bundle 6, it was a no-brainer to accept. And yes, it turned out great. We were in very good company and we got many new fans for the game. All in all it was a great way to widen the Oceanhorn audience. Jeremy: After the Android release of Oceanhorn, what’s next in the pipeline for Cornfox & Bros.? Heikki: I began the pre-production of our next game right after the launch of Oceanhorn and that game has been in development for over a year now! It shouldn’t be too long when we will go public about it, please look forward to it! 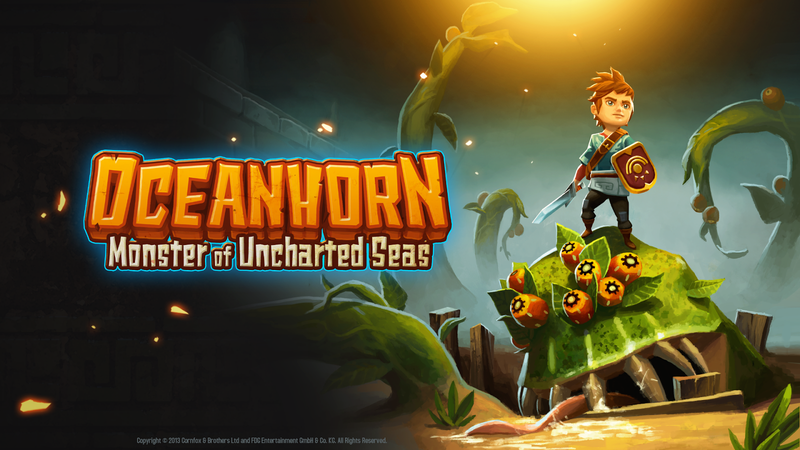 You can pick up Oceanhorn: Monster of Uncharted Seas on Steam or the App Store. You can follow more news on Oceanhorn and Cornfox & Bros. at the development blog or on Twitter.